Heat a pan with water add tamarind, turmeric, rasam powder(red chilli powder and coriander powder). Add cut tomatoes salt and hing.The tamarind smell should go. 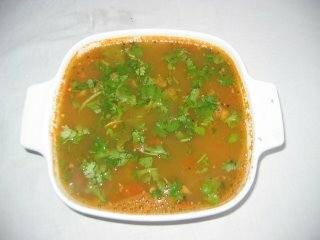 After 3 minutes remove the tomatoes and blend the tomatoes, curry leaves and ginger into puree. Add this puree and cooked dhal(dilute with 2 cups water ). Stir it well. Heat a pan with oil add mustard and cumin seeds. When the mustard crackle ,add to the rasam.